Lunar Module-9 has now been lowered to the ground after 20 years on overhead display inside the Apollo/Saturn V Center at NASA's Kennedy Space Center Visitor Complex in Florida. Apollo Command and Service Module 119 (CSM-119), the Skylab crew rescue vehicle, has been moved from its long-time location under the Saturn V rocket in the Kennedy Space Center Visitor Complex's Apollo/Saturn V Center to make way for the new display of Lunar Module 9 (LM-9). A large-than-life Fisher Space Pen and Apollo flight plan is now on display in the Apollo/Saturn V Center at the Kennedy Space Center Visitor Complex in Florida. 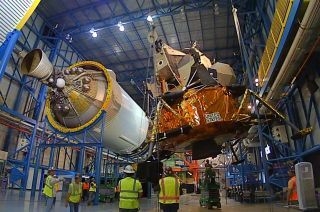 Click through to collectSPACE to watch a time-lapse of Lunar Module 9 being lowered inside the Apollo/Saturn V Center.